I’ve been thinking a lot lately about houses–what they represent about our deepest hopes, longings, and fantasies. Normally I don’t think about houses. Talking about real estate annoys me. It was hard for me in my late-twenties when some of my more interesting and quirky friends developed a mono-focus on buying houses. Instead of talking about wolf-sitings, or the mating habits of spiny dog fish, party conversations entered the flatland topics of mortgages, refinancing, and countertop tile. Yesterday I made 2 cups of hot chocolate and went to visit my friend, G., who is a local contractor. He has been hired to take a reasonably sized house and turn it into something bordering excess. He toured me around big empty spaces–the master bedroom, the massive walk-in closets, and the identical bedrooms for kids one, two, and three. While we talked through the airy rooms that smelled of drywall, he outlined some of the projects: $18,000 for wall texturing, $10,000 for a window. I silently computed how far I could stretch that same amount of money ; that one window could easily translate into a year of hotsprings, decent wine, and the lesiure to write. Dealing in numbers and blue prints, G.’s job seems deceptively mechanistic, but he often finds himself privy to some of the more intense of human dramas. Building a house can put a strain on a marriage–not just over wallpaper preferences, or money, but over deep issues of commitment. Even as he adds expensive details to this house, the couple contemplates divorce. It seems heartbreaking to me. To put all of ones energies, hopes, and love into a project and have it fall apart before it is barely realized. To find oneself living alone in a monument to things lost. Whether or not the couple’s relationships pan out, G. does beautiful work. His talent shines most when let loose on his own projects. 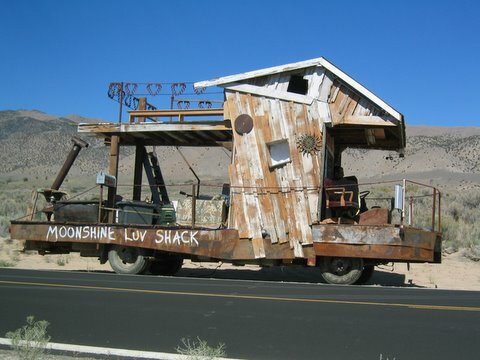 This year he built the Moonshine Luv Shack and drove it all the way to the Black Rock Desert for Burning Man. I spent a week on the shack–eating, sleeping, socializing– and fell in love with its small spaces, its odd details. Comfortable, mobile, quirky, full of love and friends, it was the best space I have ever lived in. It was a style of living that combined a sense of both mobility and settling– and felt more in harmony with real life and all its surprises. Since I got back to Ashland, friends keep asking me if I’m okay—if I’ve been lonely on the road. When I answer “yes, its-been-lonely-at-times-but-really-has-been-mostly-great” they look at me askance, as though there was ricotta on my chin and they want to subtly let me know, while preserving my dignity. “You’re not depressed, are you?” Jeanine asked, setting a bowl of soup in front of me. I looked around and behind me, as if she saw something I didn’t see. Truthfully, becoming a professional hobo has had its challenges. I seem to feel the loneliest in Nevada, where space is big and empty and my cell phone never works. There were nights parked out in the sagebrush when, after a glass of wine, after reading, after watching paragliding videos, that I’d run out of distractions and feel so lonely that it almost knocked the wind out of me. Midway through such nights I’d wake up digesting deep level truths: that I’d just lost my 14-year-old dog, ended a relationship, and that my grandma was lying far away in a nursing home bed with a broken pelvis. At night, in the middle of nowhere under the stars, held by no one at all, it’s hard to blunt these truths. They cut through my defenses with their sharp contours. Being this alone, I explain, is like taking a vitamin for the soul, the silence a cleanser. But the curios of the road never end. I stayed one night at a hotspring 15-miles outside of Wells, Nevada. In trying to find the spring, I took a wrong turn and ended up outside Donna’s Ranch—the first real live brothel I’d ever seen. It was a run-down building with a sign that read “Cold Beer, Hot Babes” and I had a strange compulsion to go inside, just to see, but couldn’t bring myself to do it. Instead I sat outside in my car for 10 minutes, waiting to see what kind of person might walk out. No one did, but one thing I noted were the nice cars parked out in front—nothing fancy or anything, but not the broken down Montecarlos and sagging yellow Plymoths that I would have expected. Just regular cars. After this wrong turn, I found the hotspring and was happy to see it was a beauty—nestled streamside, surrounded by granite spires, and long enough to swim laps in. A frosty wind howled up the canyon, but the three kids splashing about in the steam of the spring were undeterred. I walked to the edge, frost-coated grass melting under my feet and the kids guided me to the easiest place to get in. From nearby Elko, they entertained me with singing pop songs from their favorite popstar, Taylor Swift. The wind blasted our faces with glitter-sized bits of frost, the kids spashed and took turns with the snorkel mask. “Our parents are wusses!” one of them said, jumping up and down and pointing to a truck parked near my van where a couple was sensibly waiting for the wind to die down.